Amazon. 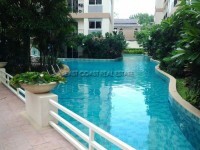 This condominium is designed and presented in a suitable way for every kind of person. The building is located just off Jomtien's 2nd Road. With simple access to the main street, you'll find yourself lots of restaurants, laundry service, mini marts and markets all around. The unit based on floor 7, consists up to 35sqm and provides 1 bedroom, 1 bathroom, 2 air conditioners, European kitchen and fully furnished. The building also services a great spectacular communal swimming pool - One great for kids especially! 24 hour security, CCTV throughout all floors and a huge spaced car park for all those who have vehicles. Offered for sale in Thai or Company Name Ownership.